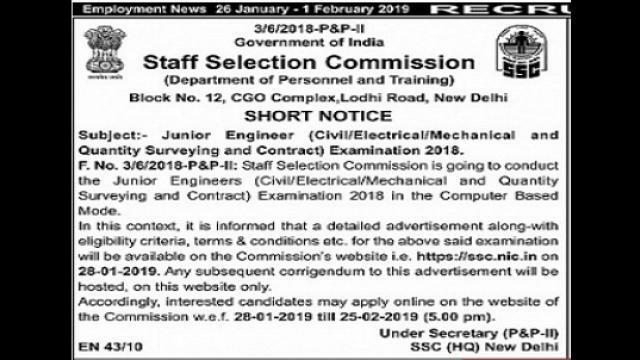 About Post – Staff Selection Commission, Department of Personnel & Training has invited you to apply SSC Junior Engineer Recruitment online form 2019. Intrested candidates can read the official notification and educational qualification or all complete details before apply online for it. Candidates who have degree /Diploma in Engineering in Civil/Electrical/Mechanical trade from recognized institute/college will be considered for this post. Candidates need to apply online from the link provided below or they can also apply through official site of the SSC before 25/February/2019.